Any robust inbound marketing content strategy on your website should include a video component. Video combines images and sound to communicate your company's vision and purpose in a manner that goes far beyond simple words on a page. 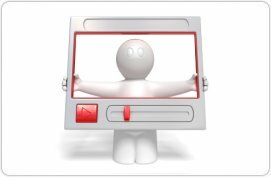 Video adds a personal dimension to your website that typical text cannot achieve. Also, having a well-produced video adds credibility to your company's website or also in customer's hands in DVD form. Like a blog post, videos are annuities - once you've published your video and it passes its initial burst of traffic, you'll continue to get traffic and branding value indefinitely. Videos are more frequently forwarded than text. No matter what the topic, videos tend to ease the subject and create a higher level of comfort. They serve as morale builders within the practice, and act as a recruiting tool outside the company. Effective inbound marketing strategies need to be executed in multiple media outlets. Some forms of information are best communicated in blog posts; some in photos or graphics; some in webinars; others in video. The smartest web marketing plan will include several overlapping medias and channels of communication which search engines like Google prefer. The more avenues you have to link back to your site and communicate efficiently, the higher your search results and more internet real estate you own. No successful movie studio bets their year on a single film. They spread their resources across multiple films, and hope they'll get one money-maker out of their portfolio. Using videos to promote your practice should take a portfolio approach. Creating a library of videos discussing various illnesses, treatments, products, etc. will only increase the ability to reach a variety of patients.